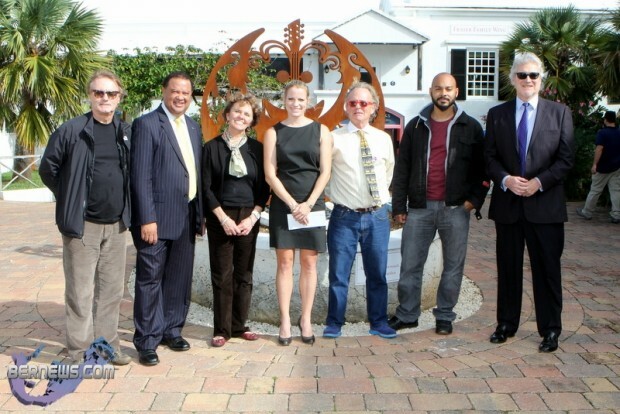 Organiser Tony Brannon recently presented $92,500 in funds raised at the John Lennon Peace Concert to various charities. $30,000 was donated to Masterworks, $30,000 to the Coalition for Protection of Children, $30,000 to Ride the Wave and $2,500 was donated to Chewstick. Performers for the evening included the Bermuda School of Music, McCartney K, Joy T Barnum, Johnathan Frith, Christina Frith, Heather Nova, The Von Friths, Bailey & Talluza Tzuke, Judie Tzuke, The Von Tzukes, Paul Muggleton, Bailey Outerbridge, Steve Easton, Mia Chambray, K. Gabrielle, Phil Morrison, Roy Young, Tiffany Paynter, Michael Cacy, Bermuda Folk Club, Chewstick, Uzimon, Biggie Irie, Errol Reid, Robery “Sai” Emery, The Love Singers and Maxi Priest. View videos of the performances here. That does not seem like a balanced disbursement of funds. Tell me about it, $30,000.00 to his own RIde the Wave and only $2,500 to Chewstick? At the end of the day, it is his to do as he wishes so who are we? I still wholeheartedly agree with you. He did the bulk of organizing it. He did the work. He is perfectly entitled to disburse the profits however he saw fit. He could have treated it strictly as a business venture & kept it all for himself & the others who put the work into it. How many of the other concert promoters donate anything meaningful to charity? $92,000 raised for charities, and people complain? And because disbursements aren’t ‘balanced’? Lets hope Tony is part of the new tourism board. The last bunch did not seem to like hard working successful people who had ideas of things that make money.